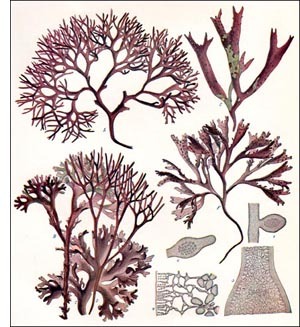 Chondrus crispus, the plant of our sketch, is a sea weed of the Atlantic. It is quite plentiful along the shore lines of the Atlantic States, Ireland, and England. It is commonly known as Irish Moss, though it is not a moss at all. It is also known as Carrageen Moss or Carrageen. It is a perennial plant, three to ten inches high, consisting of a flat, much-branched thallus, as shown in the illustration. It is variable in its coloring, greenish-purple, purplish-brown, grayish-purplish-brown, etc., somewhat waxy or translucent in appearance. It is also very variable in form, no two specimens being exactly alike. It attaches itself to rocks, pebbles, and boulders by means of a basal disk which serves merely as a mechanical support, the frond or thallus absorbing its nourishment from the sea water. In consistency the plant is cartilaginous, mucilaginous, and is entirely dissolved on boiling. When dry it becomes very hard, brittle, and elastic and assumes a light-yellowish, translucent appearance. Chondrus crispus is closely similar to Gigartina mamillosa, another sea weed, with which it is usually associated. Irish moss is extensively collected along the coast of Massachusetts, the plants being spread high up on the beach to dry and bleach in the sun. Its principal use is in medicine, although it has, perhaps, no curative properties in itself. It is a demulcent and emollient, that is, the mucilage present tends to allay irritation of inflamed mucous membranes, as in sore throat, pulmonary complaints, etc. It has been extensively employed as a popular remedy in dysentery, kidney troubles, and pneumonia. Its principal use at the present time is as an article of diet, in the preparation of soup, blanc mange, and jellies. Sometimes it is combined with chocolate or cocoa, sugar, lemon juice, etc., to improve the flavor.